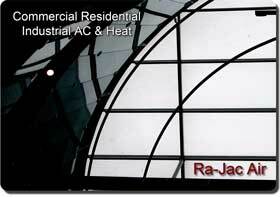 Industrial HVAC - Ra-Jac Sales and Services provides a wide range of products and services relating to industrial Heating, Ventilation, Refrigeration and Air Conditioning including Centrifugal Chillers or chilled water systems, Cooling Towers, rooftop and curbside package units, Central Air Conditioning, Air handlers, Split Systems, Heat Pumps, Oil and Gas Fired Furnaces, Industrial Preventative Maintenance Agreements, Retrofitting, New Construction Design, Cleaning, L.P. Boilers, Oil and Gas Fired Boilers, Cooling Towers, Compressors, Control Devices, Industrial Ice Makers, Industrial Refrigeration, Ductwork, Ventilation, Thermostats, Packaged units, Air cleaners & filters, Maintenance, and many more. 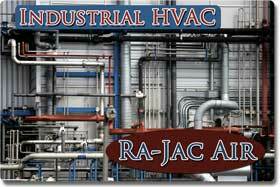 Preventative Maintenance - For industrial companies that rely on heating, ventilation, and air conditioning products, Ra-Jac Sales and Services provides a comprehensive list of equipment and services that will allow you to keep your system running with fewer breakdowns and will help you spend less on repairs and energy costs and minimize lost revenue. We can also provide preventative maintenance to your industrial heating, cooling, ventilation and refrigeration units to help prevent unexpected and sometimes costly repairs. 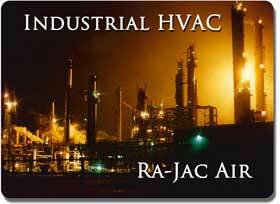 Contact us for Industrial HVAC service in the Galveston County and Harris County Area at (409) 945-4171. Our trained technicians carry a complete inventory of industrial refrigeration parts and diagnostic equipment on their vans, enabling them to make repairs quickly and efficiently allowing us to help minimize equipment down time. Our technicians are highly trained and experienced. We believe in providing our customers with the best service possible including fair and competitive pricing, top quality durable energy saving equipment, expertly trained honest and courteous employees, 24-hour emergency service, high standards of excellence, superior customer satisfaction, fast response time, fully stocked trucks, and repairs that are done right the first time. Schedule a Call Today - For over 40 years, Ra-Jac has been committed to helping businesses maximize the value of their industrial refrigeration equipment and help keep businesses that rely on HVACR equipment running smoothly. Since 1966 we have been providing professional residential, commercial and industrial air conditioning and heating service and installation for an affordable price. Our goal is to offer our customers in and around the Galveston County area exemplary service built on a foundation of honesty, education, certification, and high ethical standards. As a result of our past customer satisfaction, and attention to each customer's needs we are quickly growing into one of the leading heating and air condition service companies in the Southern Texas area. Our Texas Service Areas -- If you are in the Algoa, Arcadia, Bacliff, Bayou Vista, Clear Lake City, Clear Lake Shores, Dickinson, El Lago, Friendswood, Galveston, Hitchcock, Kemah, La Marque, League City, Nasa Area, Nassau Bay, San Leon, Santa Fe, Seabrook, Taylor Lake Village, Texas City, Tiki Island, or the Webster Texas areas and want a professional to maintain your air conditioning, heating or air cleaning and filtration system contact us at (409) 945-4171. We provide top notch service to keep your home and office air conditioner and heater working efficiently and effectively. Your comfort is our top priority.